Death of Ulfstater is Live! 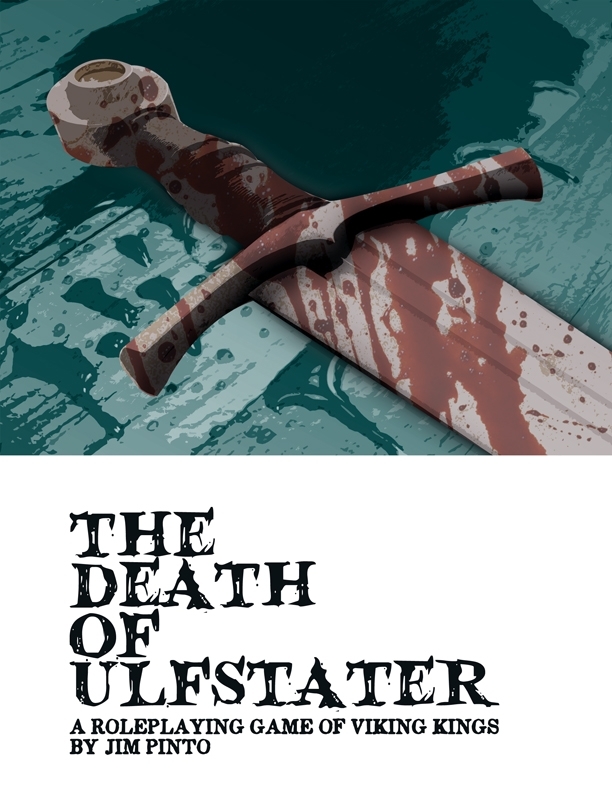 Death of Ulfstater is a story roleplaying game about the death of a Viking King and the actions of his vassals during the traditional week-long mourning. Players take on the roles of the vassals, using the week of mourning to promote their agendas and sully the reputations of the other vassals in a final effort to prove they are the most worthy of sitting on the throne. As the game progresses, we not only learn what kind of vassals served under Ulfstater, but we also learn what kind of person Ulfstater was. In the end, Ulfstater will be set ablaze and the smoke will carry his soul to one of the four Norse afterlifes — Fólkvangr, Hel, Helgafjell, or Valhalla — and a new King (or Queen) will be crowned. Death of Ulfstater is structured similarly to most GM-less, scene-framing games, with one clear exception — scenes are about only two participants trying to show-up one another in a zero-sum power grab. The other vassals can “dog-pile” onto a situation, trying to get a piece for themselves, but Valor and Drama points can be used at critical moments to focus the action and push people into or out of play. Taking turns, the vassals of Ulfstater each use one of their five stats (only once per game) to target another player and outdo them for Ulfstater’s throne. The target gains a valor point with each slight, making it more difficult to outnumber a weakened adversary. Dice are rolled and if the “attacker” wins, points change hands. Those not in the scene can influence play by giving away bonus dice to one of the participants. In a five-player game, this can be significant. The game goes around the table 4 or 5 times (equal to the number of players), with a speech about Ulfstater after each round by the vassal who ends the round. Ulfstater’s stats can go up or down during play as a result, creating a meta-kingmaker effect. In the end, all players have an equal number of turns and an equal number of uses of core abilities (Fate, Family, Magic, War, Wealth). The person with the highest total in two stats vital to Ulfstater’s reign wins the game and becomes the new king… though should Ulfstater have died a coward, it’s a throne no one will want. Next postBastille Day, Dramatic Game Engine, Protocol, More Toolcards, The Carcass, Souljar Games, What’s Next?